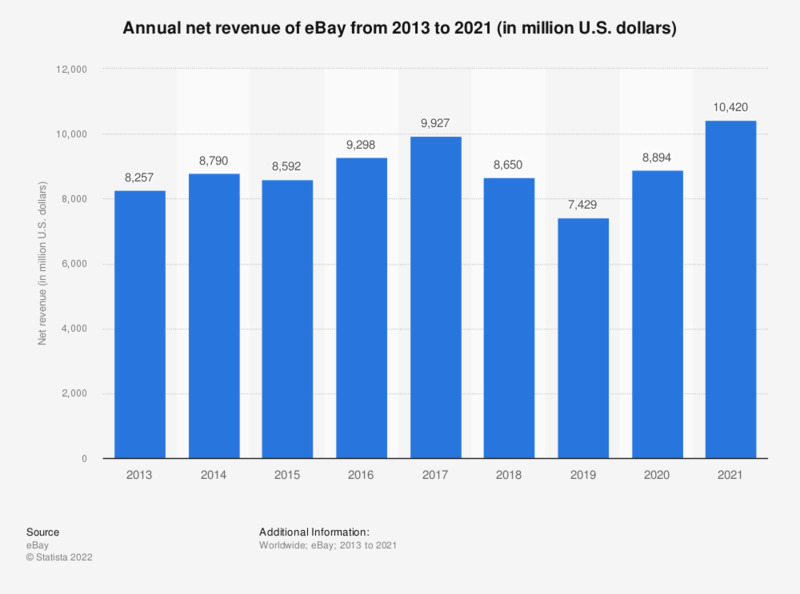 The statistic shows the annual net revenue of eBay from 2013 to 2018. In the most recently reported fiscal year, the online auction and selling website's net revenue amounted to more than 10.7 billion U.S. dollars, up from 9.9 billion U.S. dollars in the preceding year. The majority of eBay’s revenues are generated via marketplace transaction fees. Founded in 1995, eBay is one of the oldest online shopping destinations with operations localized in over 30 countries. eBay.com is a global platform, allowing people and businesses to buy and sell a large variety of goods and services worldwide. In addition to auction style listings, eBay also expanded to include fixed-price “Buy it Now” shopping, in addition to localized classifieds listings. As of the second quarter of 2018, eBay’s classifieds revenue amounted to 263 million U.S. dollars. As of December 2018, the online shopping platform had 179 million active buyers worldwide. Up until July 2015, eBay was the owner of digital payment company PayPal. As one of the most popular online payment methods worldwide, PayPal was a major revenue generator for eBay. PayPal was spun off into a separate company and post-split revenues of eBay have remained stable. The company has also managed to successfully leverage mobile to its advantage - as of July 2018, the eBay mobile app was ranked as one of the most popular mobile shopping apps in the United States. Other popular mobile shopping apps include online competitor Amazon, along with the digital offerings of traditional brick and mortar retailers such as Walmart or Target. Revenues reflect eBay's 2015 split from PayPal. Can you tell me if dealing with product labelling has been a problem when selling online to other EU countries?